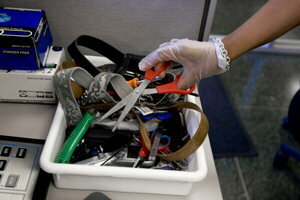 (4:35 p.m.) The "contraband tray" at the security entrance station is filled with items confiscated from visitors during the day. 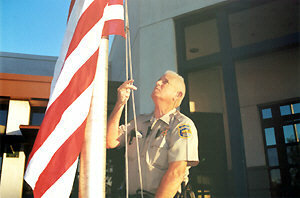 (7:50 a.m.) Deputy Sheriff Ron Lorimor signals the start of a new day by raising the flag at Butte's main courthouse in Oroville. (7:20 a.m.) Systems analyst Lorenzo Villanueva examines wiring in the main server room at the Central Justice Center. 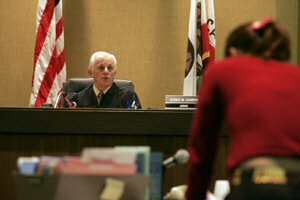 (8:00 a.m.) Judge Jerald M. Lasarow presides over a criminal hearing in his courtroom at the South Lake Tahoe courthouse. 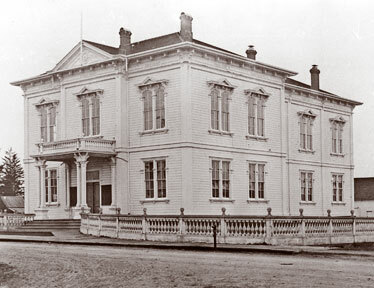 Photographs of early courthouses in each California county reflect the history of the state from Spanish colonialism to pioneer society to statehood.